Spiked Sweet Shoppe, a Seattle-based company that specializes in alcoholic ice cream, is also known for making layered jello shots. 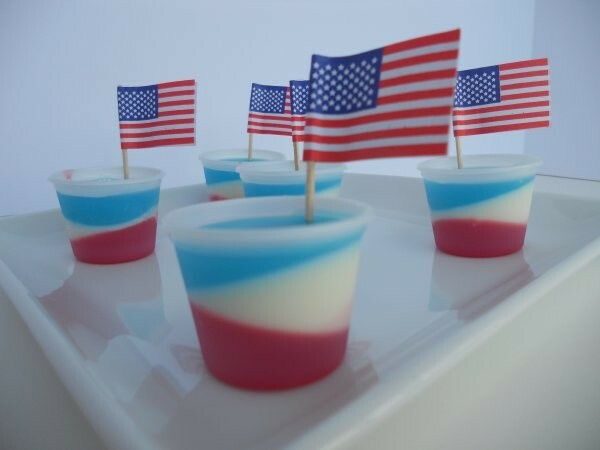 We've decided to share our recipe for making these fun, festive 4th of July shooters. -3 cups vodka (we use premium vodka, even in our jello shots. We use unflavored vodka for our blue and red layers, and a flavored vodka for the white layer. We recommend a berry, orange, or whipped cream vodka for the middle layer). -1 box strawberry jello (red), and 1 box blue raspberry jello (blue). -1 box (1oz, contains 4 packets) of gelatin. -1 can (14 oz) sweetened condensed milk. -3 cups boiling water (divided). -80 (1 oz) plastic sample cups, or 40 (2 oz) plastic sample cups. To start with the red layer, pour 1 cup (unflavored) vodka into a mixing bowl, and sprinkle 1 packet gelatin on top. Allow to settle for 1 minute while boiling 1 cup water. Add the strawberry (red) jello to the vodka while mixing. Next, slowly stir in 1 cup of hot water. Pour this mixture into your plastic "shot cups," filling them up one-third of the way. Refrigerate for 30 minutes. To create the white layer, pour 1 cup (flavored) vodka into a mixing bowl, and sprinkle 2 packets of gelatin on top. Allow to settle for 2 minutes while boiling 1 cup water. Next, slowly stir in 1 cup of hot water. Then, pour in 1 can of sweetened condensed milk, and mix thoroughly. Pour this mixture into your plastic "shot cups", layering them on top of the red. Refrigerate for 30 minutes. To make your third and final blue layer, repeat Step One. This time, replace the red jello with the blue raspberry jello. Pour this mixture into your plastic "shot cups", layering them on top of the white. Refrigerate for 30 minutes. Add American flag toothpicks once all layers have been chilled. 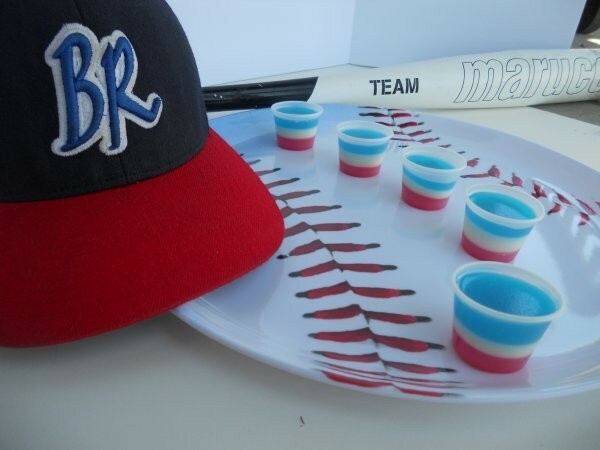 Not only will this look festive, you can use the toothpick to swirl around the edge of your plastic "shot cup" to help you eat your jello shot. Cheers! Check out our website at http://spikedsweetshoppe.com for more fun ideas! Or like us on Facebook at http://facebook.com/spikedsweetshoppe . Create "tipsy" jello shots by tilting each layer in opposite directions as they chill! Use this same color concept to cheer for your favorite American baseball teams! A bartender that founded Spiked Sweet Shoppe - a Seattle company that specializes in Spiked Ice Creams & Sorbets (yes, they pack a punch)! Check out Spiked Sweet Shoppe's website or find us on Facebook!